No, that isn’t the Philadelphia Union in the picture to the right. That’s Gam United FC. You’ve never heard of Gam United FC. That’s nothing to be ashamed of. I’d never heard of them either — at least, before this past weekend. On assignment for TheCup.us, I headed out to Aurora, Colorado, on Sunday to cover the first round of qualifying for the 2019 U.S. Open Cup. These rounds are the opportunities for amateur sides to qualify for the competition proper, which begins next year. 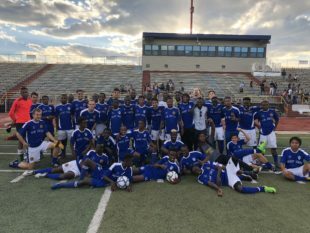 There were maybe 80 fans scattered in the grandstand of a high school soccer stadium as Gam United FC kicked off against Northern Colorado FC, the voices of the team captains barking orders audible over the low chatter of the observers. Both teams allowing themselves, just for a moment, to dream of the impossible. Before the match, Temi Osifodunrin, Gam’s general manager, explained to me that his team consisted of members of Aurora’s immigrant and refugee community. For one reason or another, Gam United’s players all ended up thousands of miles from their home land, plunked down in the middle of a new continent. And soccer was one thing that helped bind them together. Last season, Gam United participated in Open Cup qualifying for the first time, but failed to advance. The match was as wild and intense as you’d expect from two teams of very skilled amateurs chasing one impossible dream. Gam notched two goals before the twentieth minute on two smooth finishes, but found themselves down to ten men after a defender picked up two yellow cards in 35 minutes. Despite surrendering a penalty goal in the early part of the second half, Gam United persevered. You could see the fatigue on every player’s face, the pain as their striker pushed through what looked to be a sprained ankle because his manager had used all three substitutions. When the final whistle blew, there was jubilation. Friends and family streamed onto the pitch, celebrating with their triumphant team. One step closer to the impossible. On a spectacular and confusingly uncharacteristic run of form, the gritty Philadelphia Union ride into their third-ever U.S. Open Cup final feeling like the first trophy in club history is within their grasp. While the club has always taken the tournament seriously, that approach is not universal among the professional American clubs, or even among supporters. But that’s what makes the cup so special. There’s literally nothing else like it in American sports. Gam United and Philadelphia Union have almost nothing in common. All of the Union’s players will make their livelihood this year playing professional soccer, not use their real jobs to support their love of the game. They’ll fly halfway across the country to play in a stadium built specifically for soccer, not travel across town to play on a football field. They’ll play in front of thousands of fans, not dozens. And they’ll have a chance to lift the trophy, not a hazy road toward simply qualifying for the tournament proper. Yet the dream is the same for both. Where else can a team of amateur immigrants and refugees in Colorado and a trophy-starved professional side on the banks of the Delaware share the same dream? The U.S. Open Cup “is what we love about soccer,” Gam United captain Karim Soumah said after the match. It’ll all be there for the Union on Wednesday night, the most democratic dream in American sports just within their grasp. Will they take their chance? Looks like West Chester and the Uki’s are still in it. And they play each other Oct 21 at 2:30. Looks like at Uki’s. It’s the same day of the Union home finale against Red Bulls at 3 PM.